Pioneer motoring artist who worked for The Motor magazine a good example of a watercolour was sold as lot 113 Sotheby's auction 25th October 1986. 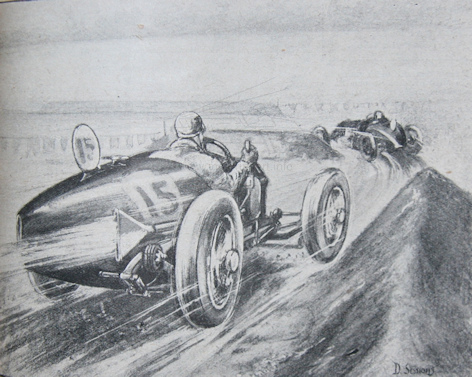 Also some illustrations in The Autocar magazine see 10th October 1930. According to recent research by Stuart Middlemiss he invented (and, in fact, marketed) a jacking system. His first name was Donald, residing or based in Willesden. In 1935, he filed a patent in the USA for a hydraulic jacking system. This gives his middle name as Wilfred, still in Willesden. His dates may be 1903-1983 according to birth and death records.